To avoid performance problems I needed to rasterise my images in the document. I somehow noticed that they get a bit blurry due to this which surprises me. I have a placed Image with 900 DPI in an 301 DPI document. I notice that the image gets a bit blurry. I would not expect that because on this zoom level one pixel of my screen corresponds to one pixel in the document. I would have expected that on this level (and zoomed out) I would not be able to see any difference. It should only get blurry if I zoom further in (for obvious reasons). Can I configure somehow options how I like the rasterisation to be? Like the resampler or something? I can't see this effect on all images, but some. Could there be a bug in the rasterisation process? Maybe using wrong DPI to rasterise to or something? This is because you're pasting a 900 DPI image into a 300 DPI document and it is rescaling it. If you set up a 900 DPI document and paste the same 900 DPI image into it and rasterise it, it won't happen. Sorry, no offense, but your answer makes no sense to me. If I zoom with Ctrl-9 every pixel of the document corresponds already with a pixel of my monitor. So I see a live rescaled version. Rasterising should not have a visible change on THIS zoom level. Maybe rasterising does it with bilinear resampler and the much sharper preview uses bicubic? I want it to look the same after rasterize. DPI (or rather PPI in this case) means nothing when working on the screen, and will only be interpreted when an image is printed. We need to know the exact pixel resolution you are working in. What are the respective pixel resolutions of both images? DPI means nothing when working on the screen, and will only be interpreted when an image is printed. Thank you for trying to help, much appreciated. But I am not sure if you understood properly my issue. I know how DPI works. Do you understand what Ctrl-9 does? The image as well as the document in the end have a effective size in pixels. What bit depth does the 900ppi image have? Is it a monochrome bitmap, or greyscale/colour? It's an RGB/8 with a resolution of 4500x3000 pixels placed at 900+ DPI in my document. My document has 301 DPI. So the effective resolution is at 33÷ of the original size. Thing is there should be no visible change on rasterisation as on that zoom level I see pixels 1:1, but the image gets a bit blurry. Why is that not a bug? I am confused by the answers I got so far... either I did not understand how DPI works or many other just don't. I tested this with a dummy 900ppi 4500x4000px image (with geometric shapes, both aliased and anti-aliased to check what happens after rasterization) in Publisher. At that resolution, the effective resolution of 900ppi is too much for print, so that is the reason you (and I as well) would rasterize it in order to get the required exact 300ppi resolution, correct? Yes, when I rasterize that 900ppi image in Publisher it becomes an effective 300ppi. And it is down-scaled to ~1077x767px. At that lower resolution the image looks much fuzzier, of course. When images are placed in Publisher it does not show a pixel preview, but rather displays the images at the actual resolution: which means the 900PPI image is not displayed at the document's 300ppi, but at a higher resolution. When it is rasterized to the document's 300ppi it is converted to a much lower resolution version, which is fuzzy looking compared to the original. Good, you got close to my point. Now look at the image while you rasterize and zoom to pixel level using Ctrl-9 before that. What do you expect? And what happens? Take a second to think about that. On a pixel level zoom you should already see the result of rasterisation as a preview. The pixels of your monitor do not change, do they? I would expect pixels to blow up by three times: 900/300 = factor 3. At native monitor pixel resolution (CTRL-9) I can barely make out some pixels shifting because of this. When I zoom in 400% the two versions compared the rasterized version looks much fuzzier. PS I work on a 2560x1440 screen on Windows with Publisher. I can't really tell the difference visually between both versions at 100% zoom. But obviously I do when zooming in more. Yes, at 400÷... of course. But it should absolutely look the same at pixel level (and not deeper). Shouldn't it? You should not be able to see and visual difference with your eye before and after rasterisation at this zoom level. Do you agree? Because what this topic is all about is my observation that there is one. Please re-read my starting post. It already said everyhing. But I'm really surprised that there is so little understanding how DPI works in a forum of a publishing software. I do not mean you specific. Just a overall Impression. When Publisher down-scales the image, it is applying a different (destructive) resampling algorithm (Bilinear) compared to what the screen display is doing for quick previewing. Then, after scaling down, the image is a different image, and the screen rendering will base its new display version on that rasterized version (which is a 1 on 1 pixel preview). Hence the shifting of pixels. Pixel preview presents an approximation of the much higher resolution unrasterized version, unlike the second rasterized version, which is not a preview but displaying the actual pixels. The approximation of the original at 100% and the final rasterized version are not the same, and use different algorithms. The result is a different than expected result at 100%. Yeah, a different resampler was my idea as a source of the problem, too. I mentioned that in the first posting. It could be an easy answer... Maybe the problem is just a missing configuration option. But instead I got really confusing answers to my topic. Including yours - sorry. As we sorted that confusion out now: Don't you consider this thing a problem? I do! I unnecessary loose detail and sharpness and have no control over that. And I noticed that by accident! No worries, I misunderstood your original question as well. As a matter of fact, I never ever scale down my images in Publisher (or any Affinity product or even Photoshop) and always scale down at the exact required size in other tools that do support better down-scaling algorithms (such as Catmull-Rom). One more thing to consider is the effect of sub-pixel positioning in design software: if the artwork is placed on a sub-pixel position, when rasterizing it may result in a very soft looking conversion. In some software this may play a negative role. I know it does in Affinity Photo, but I am unsure about Publisher. Have not tested it. This may also be a problem. I don't know how Publisher works here. @MEB Is that a possible cause of the problem? How do I avoid that? Out of curiosity I imported the same 900ppi image three times, and positioned it at sub and exact pixel positions. The result is disheartening: I would expect all three to process exactly the same, because Publisher should in theory NOT worry about the exact positioning of an image. You'd expect this to be a purely internal processing. I would have hoped for the same result in all three cases, but Publisher instead calculates the absolute positioning on the page as a extra factor. It really should not do that in my opinion. It should take the image "as is", and work from there. At least, that is my opinion. To be fair, we're really nitpicking here. I doubt anyone would see any difference when the job is printed. And I'd also suggest doing this type of work outside of Publisher (or any DTP app - other DTP apps don't even have a rasterize option - often for good reasons) in a proper image editor, and then re-import. Seems so that there are two causes that together can lead to the pretty bad rasterisation results I observed. If there was no memory issue I would never rasterize my image layers, but this may effect the export as well (for the sub pixel issue). Yes, I printed my book already and it's hard to tell if the bit blurry images result from that effect or is just a result of the photo paper and sharper source images would not have changed anything. I'm not entirely sure. Hard to tell. But I would appreciate a fix for this problem anyway. Even if it's not highest priority. On a side note: I'm always very picky about detail & sharpness. Up to a level that I use Canon DPP instead of Photo Developer because it could not recover as much fine detail. Dunno, keeping max quality possible in every step is a important concern to me. So I care about problems like this. At least devs should be aware that this problem exists. But there is one, so you need to rasterize them, or resize them outside of Publisher and make them the size you'll want at the DPI of your Publisher document. Doing that work outside Publisher may give you better results, especially if, as @Medical Officer Bones suggested, you can use a program with better resampling options. If you can't, and must use, for example, Photo, you still may get better results. By the way, why are you using 301 DPI for your document, rather than the usual 300? I might think that was a typo, but I seem to recall seeing you mention that before. Yeah, I think you're right. It's just a cumbersome process at the moment. I hope for the Photo Persona that it will solve this problem... Resize & Rasterize in one step by controlled options would help here a lot. I hope they plan for this. This is indeed a really good question I'm also curiuos about. I did not ask that, but I may, if nobody here knows. I took the specs from my printers info page. I already sent him a PDF with the requested 301 DPI and got a printed book back that looks exactly like in Publisher (except for slight color differences of course). But why he wants 301 instead of the usual 300.. is there a mathematical rounding issue or something? Another tier of his papers requires a round 400 DPI. Can you confirm this problem and log it to the devs? Is your View Quality in Preferences > Performance set to Bilinear or Nearest Neighbour? I was set to Nearest Neighbour when I first replied (for some reason). After switching back to Bilinear, I don't get this no matter what dpi my document is or what dpi my image is. If you are on Bilinear and you get this, I'd really like to get a document from you otherwise I haven't got anything to submit to the developers. @Chris B My Publisher is set to Bilinear (best quality) when I tested this. create a 4500x4500 image in an image editor, draw some geometric shapes, some with, and some without aliasing. set the PPI of this document to 900PPI. Save. Import four times in Publisher. Position the first layer at exact pixels (for example, X:100px, Y:100px. Position the second layer at decimal pixels. I did .5 pixel values. Position the third layer at a non-decimal X value, and a decimal .5 value for Y.
Rasterize the first three layers. 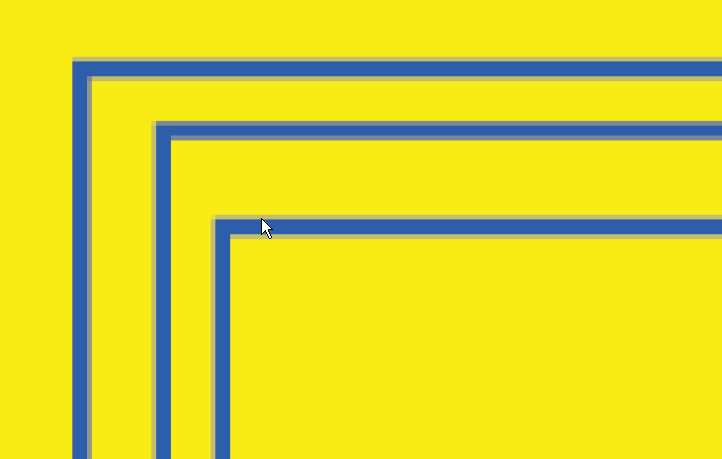 Result: three different rasterized versions. Zoom in to see the difference. Publisher uses the same internal code as Photo and Designer to rasterize layers. Ideally this should not be the case, in my opinion, and the positioning of an object in Publisher should have no impact on what it looks like after rasterizing. Is this Information enough to reproduce the issue or do you need more input?